Smoothies and Açai na tigela... at home! 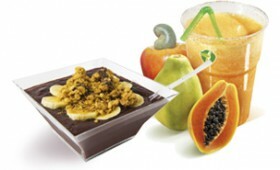 delicious, refreshing and nutrient smoothies with the whole unmistakable taste of Brazilian fruits. açaí na tigela (“açaí in the bowl”), a nutritious, healthy and complete vegetarian (actually, vegan) meal. You just need simple tools: a good mixer, one knife and a scaled glass, if the glass of your mixer is not scaled. Watch the videos that explain how to make these delicious specialties!